3 month recap: I've been working. Yes, I'm a workaholic. I've realized that if your project goes horribly wrong, it leads to client calls and meetings. The only thing I hate more than cranky clients (they have my cell phone number) is meetings! If I have to work until 14 hours a day to make sure that my clients think I'm a genius, the I will see you at home at 10:30. So, I'm proud to say that none of my clients files got screwed due to an error on my part. Actual, real ice was involved, literal ice! Its been a rough spring, did you hear that even Houston Texas was hit by "Snow-pocolypse" 2014? Don't laugh, we are winter wusses and we are proud of it. It hasn't gotten this cold in 4 years! The 3rd freezing day (32 degrees, so yes technically its freezing) of the year, I just called in sick not even bothering to "work from home"! Hey, I have a 6 foot walk to my car, I'm sure that people have frozen to death in less time! Maybe not in Houston, but somewhere in the world. 1. I bought 3 pairs of gloves this winter, but I could never find more than one glove at a time. 2. My winter coat is lined, but not insulated. I'm actually proud of that. 3. I own 3 long sleeved shirts, one has a hood. Only 2 of them could be considered business casual. 4. By the first week in March, its back in the 70's where its supposed to be. Point 3 leads me back to Marfy 9462. As in my previous post, I love the collar, but fabric restrictions (4 ply silk crepe) and climate restrictions dictate I'm making tulip sleeves instead of the long sleeves shown. 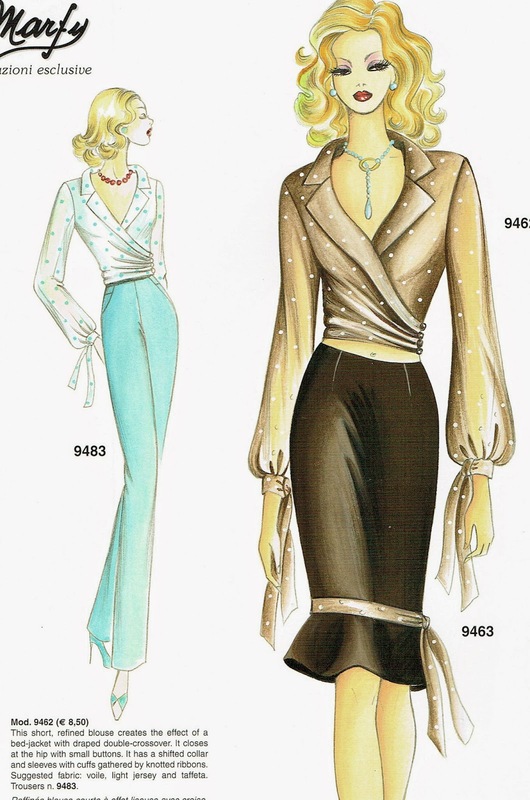 I based my sleeve drafting on Rhonda's creative life tulip sleeve drafting found here. You really should follow Rhonda's Creative Life, what a genius! Rhonda is such a talented, creative genius who has an incredible mind for the architecture of sewing. I started with the original sleeve from the pattern, I added width for my 15 1/2" upper arms (leaving a little extra ease at the cap) and pulled out my 5/8" seam ruler for the drape. Original upper bicep width for a size 46 is generally about 13 1/2" to 14" so this is a normal adjustment for me. The front and back sleeve now fit perfectly on my remaining scrap of fabric without worrying about the sleeve being wide enough! I also cut the pieces from off-white Bemberg lining. 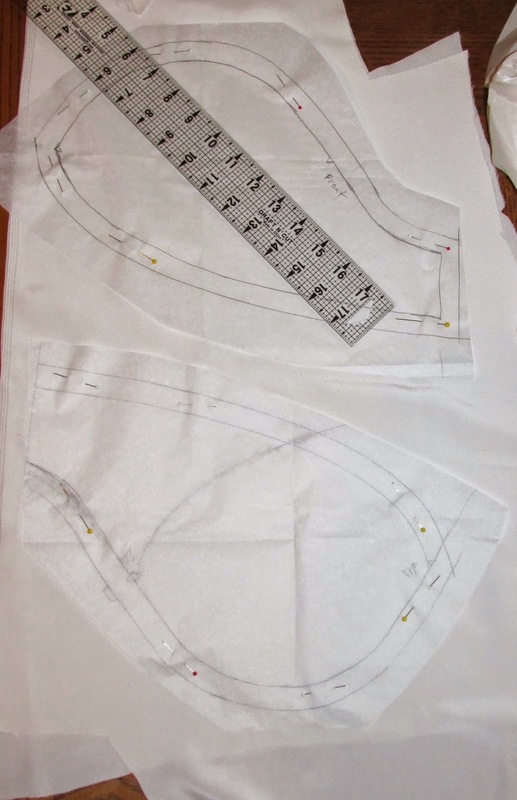 first I will sew the fabric and lining together at the hem and under stitch, then I will insert the sleeve into the shirt body and either bind or serge the armhole. Then I need to tweak the fit on the sides, fine-tune the side zipper and workout the hem. It sounds so quick when you put it that way! This should be so easy, I have 5 days of comp time and floating holiday but I'm off to a slow start. When you haven't had more than one day off since mid-January you spend at least half a day wandering around the house picking up shoes and sorting laundry. Then, you clean the fridge and throw away all the stuff that wasn't actually fuzzy and green when you bought it (kiwi not included of course). I also spent time in personal retrospection (sitting on the couch, bonding with the cats). Lesson 1: A martini and a cheeky British Murder are beautiful things on a Thursday afternoon. Lesson 2: I can't really spend an entire day doing nothing but watching TV, its physically impossible. But, it was totally worth the scientific research that lead to this discovery. That isn't really a bad thing. Lesson 3: I really don't like personal income taxes. I've spent too much time on the mobile with the Internal Revenue Service lately, due to no fault of my own of course. The deadline is April 15, not a moment too soon! Tomorrow I set in sleeves and cut another Marfy top so stay tuned. My Marfy purchases can be found on Pintrest. I have great plans for Pattern Review Weekend in May, more info later. As well as a knit shirt sew-a-a-long. Fabulous blouse.... Fabulous pinterest board. Love almost all of the patterns you pinned. Great post... the description of Snowpocalypse made me giggle particularly the clothing issues. Turn it on its head and that would be me in summer.... do I have anything cool enough....where the heck is my only strappy nightie, the ice cube tray and my swimming cossie. But only being able to find one glove in winter.... that one I know all about. Good to see you posting and sewing again. Loved your pinterest board. A lot of patterns I would like to make too. So glad you have survived the snow and work! I've been admiring your Marfy pins for a while now and really like quite a few of them. The tulip sleeve for your blouse will completely change the look of it, can't wait to see it. Yay! Your back! It has been a rough winter for us here in Canada as well. We did a fair amount of complaining about it too! I can't wait to see this blouse and I'm now interested in trying out this tulip sleeve tutorial. I'm going to head over and check out your Pinterest board now :) Again...welcome back. LOL Becki, you had me rolling on the floor! Great post!